Server Island is a tropical island located approximately in the center of the Palm Sea in Palm Grove. Like Flangton Island and File Island, tourists and vacationers come to this island in droves every year to catch some of the best weather that can be experienced in SW City. Server Island was once a volcanic island, until the volcano subsided and eventually died. Over time, the volcano that once stood here has been worn and weathered down to create a large plateau that was capable of inhabiting. Most of the tourist destinations sit atop of this plateau and can be reached by the Server Island Gondola which connects the southern part of the island into the Server Island Visitors Center. Here, visitors can get an idea of what activities to partake in. Activities include the Server Island Cliff walk and cave exploration, getting a bite to eat at the local pizzerria or visiting the martian landing site. Server Island is connected with File Island by a small bridge and can be accessed from the mainland via Palm Sea Ferry. Large amounts of tropical beach surround the entire island. What once was a volcano in the center of the island is now a sixty-five meter plateau where most of the island development has taken place. Palm trees make up the majority of flora on the island. Halo Bushes are abundent on the plateau. Some small hills are visible on the peninsula that sticks out on the northwest side of the island. 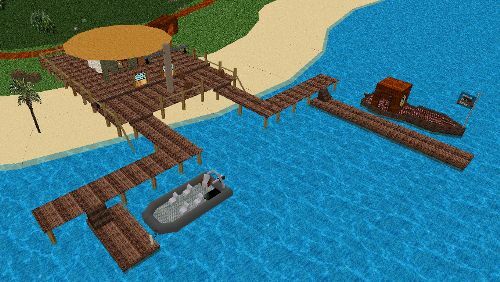 Two different docks were constructed on Server Island. One, on the east side of the island, is for personal and ferry docking. The other, which is on the north side of the island, is for small cargo ships. These ships mostly drop off food-stuffs and store it in the warehouse here for the residents and visitors of the island. A lighthouse was built on the tip of the northwest peninsula to alert oncoming ships of the shallow water between File and Server Island. The gondola which takes passengers up to the peninsula was one of the first buildings constructed on the island. A flurry of construction soon took place on the peninsula which included permanent housing, visitor's center, hospital and helipad, numerous dining establishments and a large central dome which sits over the old volcano. Visitors can enter the dome and take a look down into what was once the mouth of the volcano. A rock chute was also constructed from the top of the plateau down to the docks, where ships would carry away waste slag and rock that was bulldozed during construction. Vortech also owns a radio antenna on the plateau which services most of southeasten SW Island with radio and television signals. The initial building of the antenna originally caused a lot of uproar from residents and frequent visitors to the island but the great increase in digital entertainment and communications quality quickly hushed them when construction was complete.